Also, have you thought about implementing the equivalent of *ix pipes on this? I have thought about it extensively. 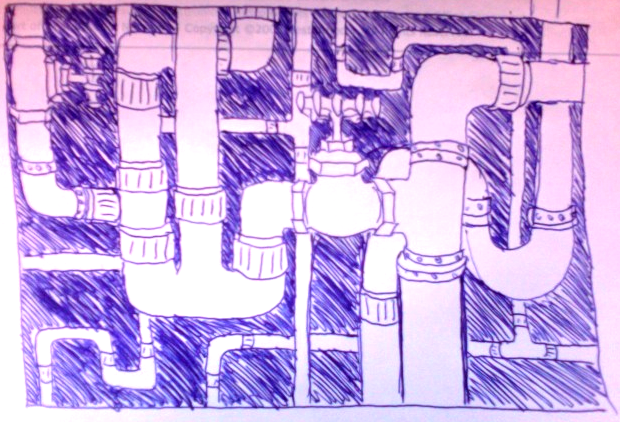 Not only that, I snuck a very, very preliminary version of pipes into Ubiquity 0.1. Try this! Issue “trans hello to korean”. Hit Enter to execute it. With nothing selected, issue “email it to “. Um, is this for real? 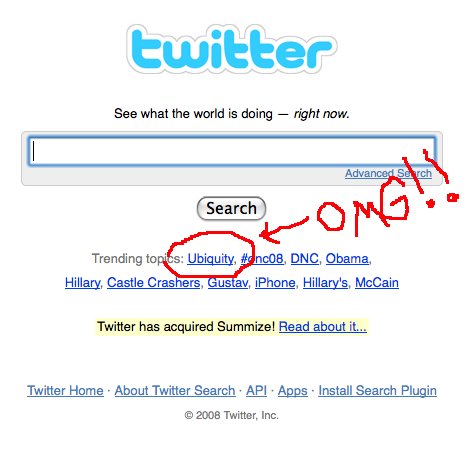 Are they talking about some other thing called Ubiquity, or is our little extension actually getting more attention than Obama, Hillary, McCain, the Democratic National Convention, and the iPhone? Judging by the traffic on the Ubiquity mailing list, which exploded overnight, we’re going to need to set up some scalable infrastructure for bug reporting, feature requests, and tech support. I’m not a publicity seeker — really all I want to do right now is start working on version 0.2 of the parser — but, wow. Hmmmmm. Maybe I was taking the wrong approach in my previous post about tabs. Incremental improvements won’t get us to the desired state of think-about-it-wiggle-your-fingers-and-you’re-there-ness. Let’s go back to first principles and see if there’s a different way to think about the tab problem. When you want to get back to a tab that you have open, how do you identify the tab in your mind? I’m not asking how you would describe the tab to someone else — I’m asking, at the moment that the thought occurs to you that you want to go to a tab, what does that thought consist of? I suspect that the answer will vary between people, of course, but also that each person identifies tabs by more than one method, depending on the tab contents and how they’re being used. Do some introspection — I’m very curious to hear what you notice about your thoughts. For example, I’m the type of person who relies very much on visual and spatial cues in most things that I do. I’m very map-oriented. But I find that visual and spatial cues in the browser are too weak to be of much use to me when navigating tabs. My tabs are not consistently in the same places, and most of them look very similar because the pages I use most are almost all text and no images. So I rely mostly on the textual content of pages or the activity that they’re associated with. Here’s an even deeper question. When you want to go somewhere, does your brain even distinguish between wanting to go to a tab that’s already open vs. wanting to go to a site? Does going to an open tab feel like a different action from opening a new page, or do you think first “I want to go to page X” and only then stop to think about whether you already have it open or not? I’ve got no answers here, only questions.